The Junction Point losses are supposedly just the tip of the iceberg, with hundreds of Disney jobs rumored to be in jeopardy. 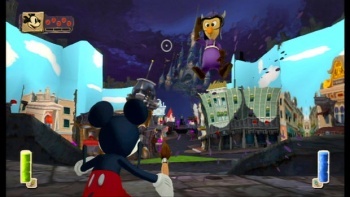 Junction Point Studios, the developer behind the recent Wii exclusive Disney's Epic Mickey, has had to lose a few people, as parent company Disney restructures its interactive media division. This comes just days after Disney announced the closure of Tron: Evolution developer, Propaganda Games. It's unknown exactly how many people have lost their job, although Disney says the effects on Junction Point are relatively small. It's been confirmed that the studio isn't about to be closed, and its most high-profile employee, founder and Deus Ex creator Warren Spector, is still there. A Junction Point spokesperson declined to give an official comment, however, saying that she had been "affected" by the restructuring. Sources also suggest that Disney Interactive Studios has suffered heavy losses, with as many as half of its 700 staff affected. As sad as it is, it's not uncommon for a studio to lose a few people after a project wraps up, and "restructuring" or "realigning of resources" is often cited as the reason. But it sounds like the changes that Disney - or at least its interactive media division - is going through are much more significant then just gearing down after shipping a game. Disney CEO, Bob Iger, has said in the past that there isn't the money in console development that there used to be, and that Disney would be reducing the amount it spent on big console releases, as well as diversifying into other areas. It seems pretty likely that the layoffs, not to mention the closure of Propaganda, are all tied into that plan.